It took 14 years to build and it cost 15 million dollars and the lives of 20 workmen. Like the Atlantic cable and the Suez Canal it was a gigantic embodiment in steel and concrete of the Age of Enterprise. McCullough's outsized biography of the bridge attempts to capture in one majestic sweep the full glory of the achievement but the story sags mightily in the middle. True, the Roeblings, father and son who served successively as Chief Engineer, are cast in a heroic mold. True, too, the vital statistics of the bridge are formidable. But despite diligent efforts by the author the details of the construction work -- from sinking the caissons, to underground blasting, stringing of cables and pouring of cement -- will crush the determination of all but the most indomitable reader. To make matters worse, McCullough dutifully struggles through the administrative history of the Brooklyn Bridge Company which financed and contracted for the project with the help of the Tweed Machine and various Brooklyn bosses who profited handsomely amid continuous allegations of kickbacks and mismanagement of funds. He succeeds in evoking the venality and crass materialism of the epoch but once again the details -- like the 3,515 miles of steel wire in each cable -- are tiresome and ultimately entangling. 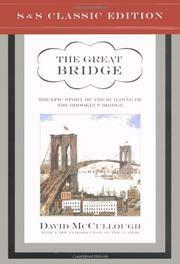 Workmanlike and thorough though it is, McCullough's history of the bridge has more bulk than stature.